Mayawati, shown seated, is one of the most powerful women politicians in India. Originally from a low caste family she has spent millions on creating a powerful political base for herself and erecting numerous statues of herself. On her birthday she is known for wearing pink. Sampat Pal, another woman from a low caste family, has taken up the rights of women abused by their husbands, often beating up the abusers, and rescuing the abused. 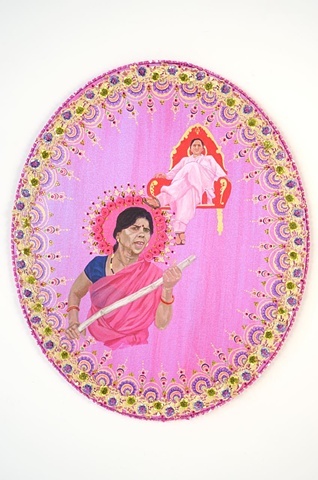 Her followers are known as the Gulabi Gang, the 'pink' or 'rose-gang'. She was offered power by Mayawati but turned it down.